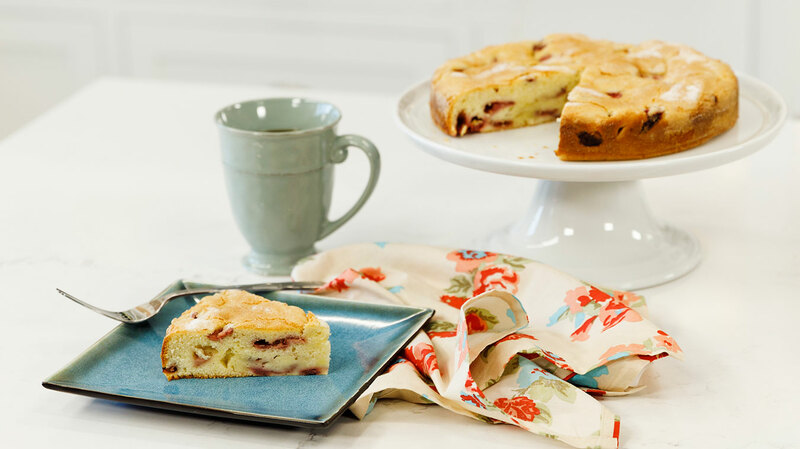 Welcome spring with a strawberry filled cake, perfect for a special weekend brunch! 1 tsp Amoretti® Lemon Extract W.S. 1 tbsp + 2 tsp Amoretti® Cookies & Cream "Stracciatella" Extract W.S. Preheat oven to 350°F. Grease a 9" cake pan and set aside. In a bowl mix together flour, baking powder, and salt. In a separate bowl, cream together butter and ¾ cup sugar until fluffy. Scrape mixer and add Madagascar Bourbon Vanilla, Lemon Extract, and Cookies & Cream Extract. Mix until thoroughly blended. Add half dry ingredients, then the sour cream. Add the rest of the dry ingredients and mix until just combined. Spread batter in the greased pan and sprinkle with remaining 2 tbsp sugar. Bake for 40-50 minutes, or until a toothpick comes out clean.